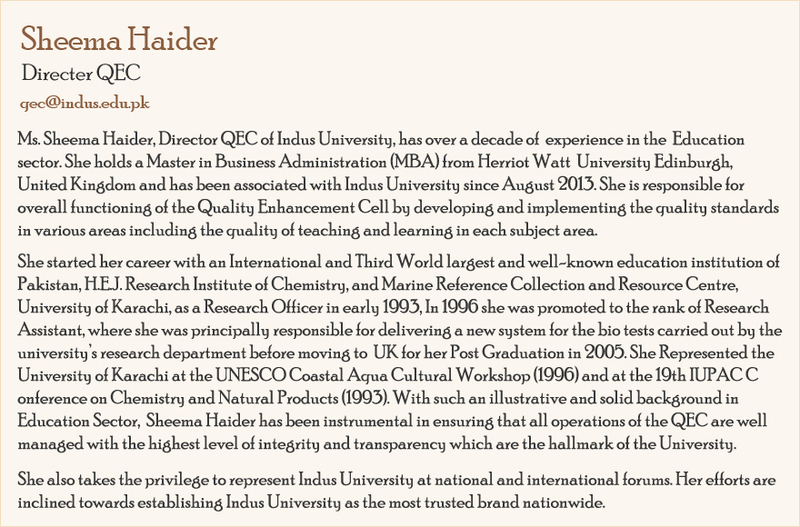 Ms. Sheema Haider, Director QEC of Indus University, has over a decade of experience in the Education sector. 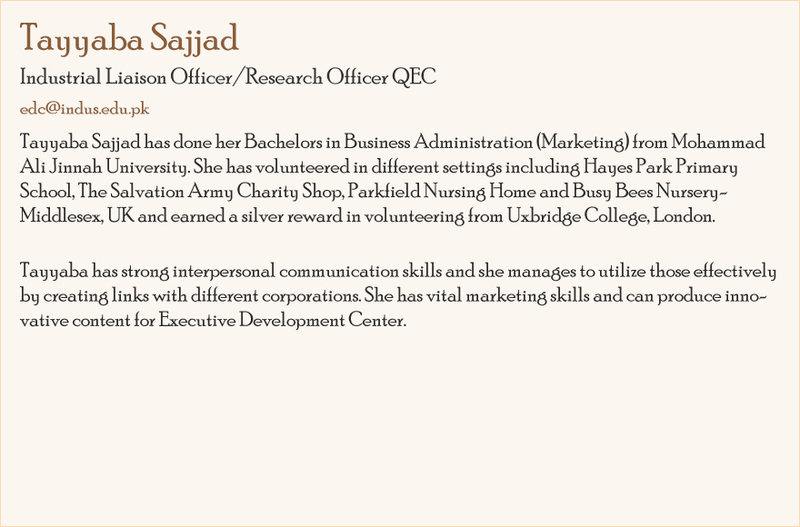 She holds a Master in Business Administration (MBA) in from Herriot Watt University Edinburgh, United Kingdom and has been associated with Indus University since August 2013. Arisha Maham earned her degree of MSc in Statistics from University of Karachi & currently enrolled in MS Statistics & Scientific computing program at Institute of Business Management. She has more than 3 year of experience in Quality Assurance. Mr. Tariq ali has done his Master’s in Naval Architecture and Ocean Engineering from China. He has a sound knowledge in research as well as a fine command on speaking and writing Chinese Language. 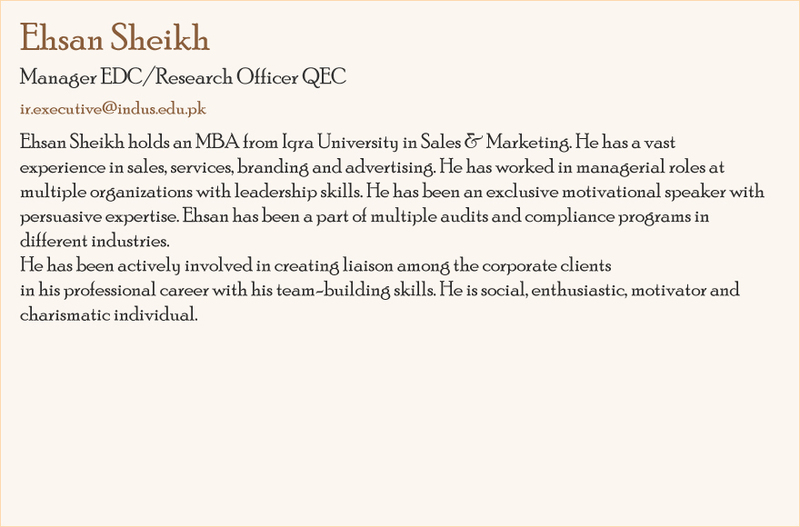 Ahmed Akmal Holds MBA (Marketing) equivalence of M.Phill from SZABIST and had several International Certifications from reputed Turkish Universities on entitled Entrepreneurship & Innovation as well as The Growth of world Economy. Parvez is a dedicated and hardworking person in the Quality enhancement cell. He has done his intermediate and currently pursuing his bachelors in commerce as a private candidate. His 5 years of services to Indus University is remarkable.